﻿ Welcome to Ajanta Pharma Limited. Ajanta Pharma views Research and Development as a vital component of Business Strategy that will provide us with an competitive advantage. We recognize that 'innovation is the key to success' and have been consistently investing in R&D over the last decade. 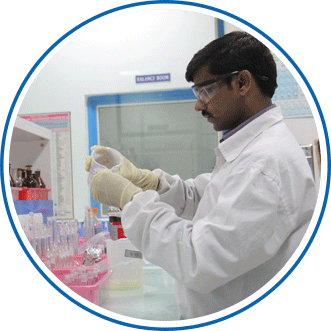 Company's R&D facility has 850+ diligent and committed scientists. Based in Mumbai, the facility has a range of state-of-the-art equipment for formulation development, working on different dosage forms such as topical creams, ophthalmological preparations, nasal sprays, solid orals, liquids and dry powder inhalers. We have an equally well equipped Active Pharmaceutical Ingredient (API) lab at this R&D Centre to synthesize high value APIs for some of our key products. Many of the formulations developed by our R&D are first of their kind and now hold leading positions in their sub-therapeutic segments across different geographies. The research centre primarily focuses on development of new formulations with an objective to introduce first-to-market products providing Convenience And Better Patient Compliance. We have been taking continuous initiatives towards technology absorption, adaptation and innovation at our R&D Centre, resulting in the upgrade of all equipment to encompass latest technological developments in the field of research. Few of our notable R&D achievements are in the segment of anti-malarial with our flagship brand, Artefan - the first generic product to have been pre-qualified by the World Health Organization (WHO), Geneva. Our other key brands include Kamagra (Sildenafil Citrate) & Apcalis-SX (Tadalafil), both used in the treatment of Male Erectile Dysfunction. These are available in the conventional tablet as well as in an innovative "jelly" form which is the world's first of its kind dosage form for this molecule. Our R&D hub is fully equipped with modern amenities and technology for accessing reference material, environmental monitoring, data collection & analysis, record keeping and archiving.